Fire suppression systems utilise high pressure vessels which must be maintained by law. The process of testing is achieved by hydrostatically pressurising the pressure vessel that contains the fire suppression agent. Hydrostatic pressure testing must be carried out every 10 years. The pressure vessel (fire suppression cylinder) must be decanted, cleaned then dried. Once the contents and contaminates have been removed the fire suppression cylinder is filled with water. The cylinder is pressurised to one an a half times of its working pressure. The certification is carried out by a third party under strict regulation. Hydrostatic Pressure Testing is compulsory and it is an offence not to have this done every 10 years. Our company offers a same day service exchange. 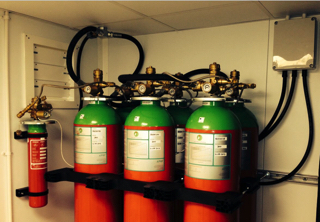 We will arrange for the identical fire suppression cylinders to be delivered to site. The fill, pressure, make and manufacturer of the cylinder will be identical. The gas is certified and tested and is also purified during the Hydrostatic Testing process. There are no emissions during this process, so any impact on the environment is negligible. With FM200 and Novec1230 fire suppression systems it is more challenging, as the size, shape and fills are mostly varied from application to application.